noodle soup bowl using coconut milk broth. 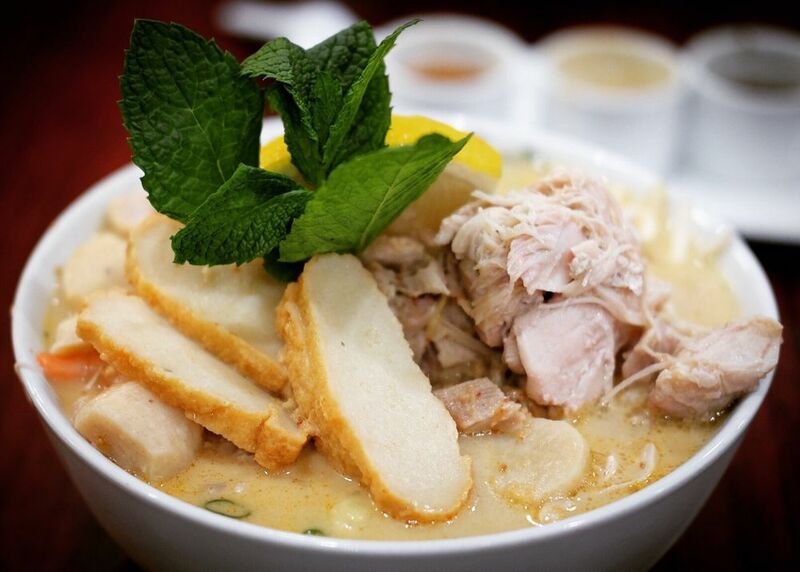 Soft round vermicilli rice noodle and shredded chicken served in a flavorful creamy coconut milk broth. onion, mint and lemon wedge. Or make it a combo (as pictured above) by adding shrimps, fish balls and fish cakes. Note* chicken may be dark as we also use chicken thigh/dark meat. 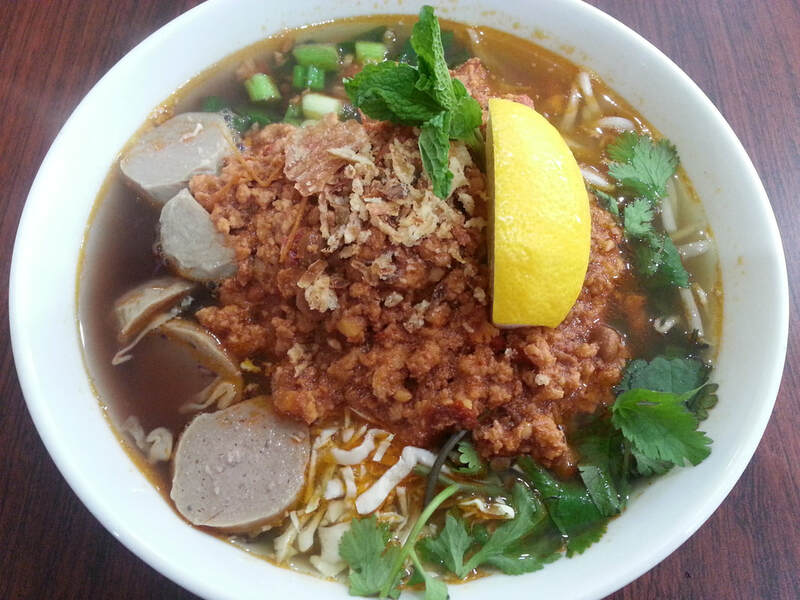 using fermented soybean and ground pork and fresh tomato broth. and tomato soup broth with ground pork. Mixed with bean sprouts, sliced cabbages and green onion with mint and lemon wedge. Note* May be slightly salty to taste from the soybean. ​Please Note: If you order any of the noodle soup bowl, we recommend that you try the broth first before adding any condiments. Our broths are already infused with flavorful ingredients simmering in the pot. Also: You can customized your soup bowls however you like. Please ask the servers/chefs how it can be done. Sai Gok: Traditional lao sausage. 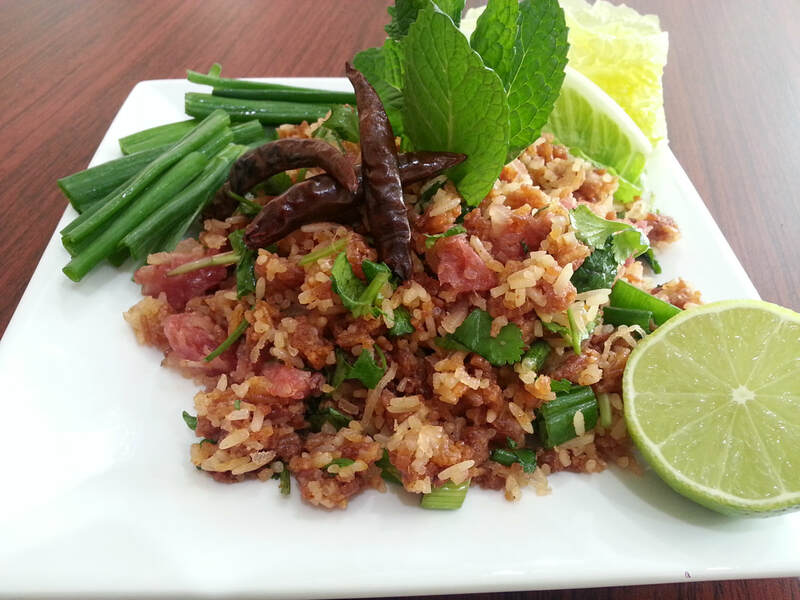 flavorful Lao sausage. Infused with oriental herbs and spices. Served with choice of steam rice or sticky rice, seasonal veggies and chilli tomato sauce dip (jeow mak len.... choice of mild or spicy). Sliced chicken or tofu sauteed with coconut milk along with diced potatoes, bell peppers, onions and basil. Very aromatic and full of flavor. Served with steam rice.